Happy Lunar New Year’s eve! For those who celebrate, what are you guys cooking up, and who ended up trying this recipe? ; ) I’ve been MIA as we spent a few days in NYC before hosting my family for the holiday. Five months into motherhood and I still haven’t figured out how to blog and get things done while looking after Nori (girlfriend doesn’t like to nap longer than 45 minutes…), so hats off to all the multi-tasking mamas out there! When in NYC we always love eating our way around the city, but given the frosty weather and a teething baby on our hands, we traded sit-down restaurants for more casual grab-and-go fare this time. I recapped some tasty spots below, and please feel free to share your favorite restaurants and any unique desserts for us to bookmark and try next time! We were right near a Uniqlo, which was convenient for stocking up on their thermal pieces. I own a few different styles, but my favorite is still their thinner Heattech scoopneck tee which has a smooth finish, and layers inconspicuously under blouses and sweaters. I wore mine under this soft fleece zip up jacket then layered a wool coat over everything. The zip jacket is unlined but pretty warm for a fleece, and the extra cozy pockets are the best part. While at the store, I also tried on their “3D knits” in this cocoon sweater silhouette. 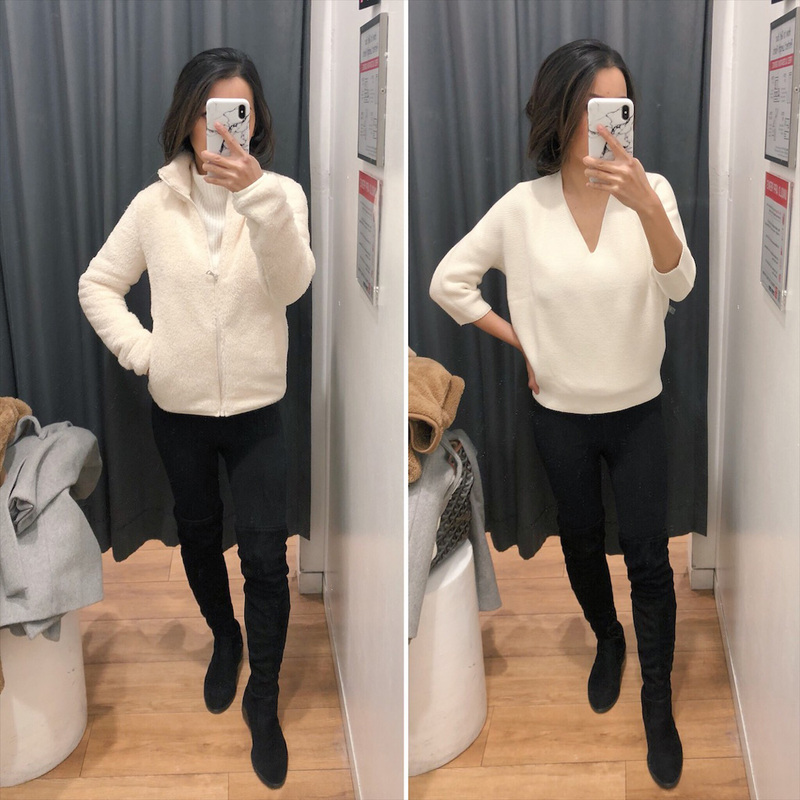 An XS was petite-friendly and a good length on me, and the knit felt medium to thicker in weight. I tried on a S as well for a more slouchy, oversized look, but the back part poofed out too much in a size up. I’ve heard good things about Uniqlo’s “support” shapewear shorts so also picked up a pair to try. The size S is fitted on me and they feel lightweight and not too restricting, with what I’d call a medium amount of shaping. I might try their “smoothing” shapewear shorts next to compare – not sure why they don’t have one style for both support AND smoothing? Someone enjoying our room with a view! In Hope & Henry baby knits with faux fur. We booked the Langham hotel which has good sized rooms (especially by NYC standards), and it felt kid-friendly thanks to their helpful service. The staff all know your name, they stock you up with bottled water & treats, and there’s a courtesy car for guests to ride in. We were able to roll the hotel crib into a separate, roomy closet area, which spared us from eating quietly in the dark while the baby napped. We also loved being based between Koreatown and Bryant Park, and were able to walk to each of these spots below! The Bryant Park rink was split into skating and bumper cars on ice (available until the end of February), which looked like a blast! We watched from inside the Lodge, a heated tent of food stalls, while sharing a beer and one of these decadent desserts. Poketeria – I’m still patiently waiting for Boston’s poke scene to start catching up to options in SoCal or NYC! The bowls here were pretty good (loved their “bomb sauce”) but I came here for the sushi donuts. I expected it to be gimmicky, but it was actually tasty with a spicy crab filling (or avocado, upon request). They also make adorable mini donuts for catering, which I’d be ordering all the time for parties or gatherings if I lived there! Tonchin New York – We warmed up here with piping hot bowls of ramen, including their spicy peanut Tan-tan noodles and their pork-based Tokyo Tonkotsu ramen. I loved the springy noodle texture and how the flavorful broths were not too salty like many ramen spots, but they were a little too rich for me to finish (Totto might still be our favorite). Stackery – Located inside the temporary Bryant Park Lodge, this spot makes Hungarian-inspired chimney cakes that have been all over Instagram. The employees were very friendly and the desserts are eye-catching, but it was a small challenge to eat and very sweet, so 1 of these is definitely enough for two to share! Grace Street – Another one of our regular spots for dessert and a warm drink with friends. We usually split one of their fluffy shaved ices, the Korean donut/pancakes with ice cream, and hot milk teas or lattes. Five Senses – One of our favorite dine-in Korean restaurants with flavorful hot pots / stews to share. For takeout, we got their squid & pork belly with udon, kimchee fried rice, stir fried fresh ramen, and ddukbokki spicy rice cakes which made for a satisfying night in with friends. Izakaya Mew (not pictured) – A reasonably-priced Japanese “tapas” style restaurant on the same block as our hotel, with cocktails, sushi, and lots of small plates for sharing. I like their kimchee cream udon, uni (sea urchin) rolls, and seared sashimi / carpaccio. If you’re dining in, definitely go early or during off hours to avoid a long wait! Indikitch (multiple locations) – Fast casual indian food (think an Indian-style Chipotle) that was actually pretty good. You get to mix and match your choice of a “main,” sauce (tikka masala, vindaloo, korma, Kadai, or Saag) and a spice level and they fire it up in front of you, so it comes out nice and hot. Sure it may not be authentic, but I’d love a chain like this in Boston to spice up our grab & go food scene! Cafe Zaiya – An unassuming small bakery / cafe with prepared savory Asian foods, pastries and sweet treats. We usually grab bento boxes and onigiri (filled rice balls) from here or Sunrise Mart next door, and satisfy cravings for a soft serve cone. I prefer matcha only but Nick’s a big sesame ice cream fan, so Cafe Zaiya is the spot to get both in one swirl! Nick was on a panel with Adobe Lightroom in NYC and they had the cutest photo setups! Too bad I was bundled up for the arctic freeze, otherwise would’ve gladly taken advantage of the backdrops. I stopped by with Nori and she was so stoked to see her papa and these balloons! I love Uniqlo and had to take a closer look at that cocoon sweater. The back is so interesting, right? You can really see the stitch detail on the grey one, so I bought one. Thanks, as always, for the tip. Highly recommend bonsai kakigori next time you’re in the city! Super yummy japanese shaved ice. It’s in the canal street market in chinatown. There’s also a joes steam rice roll there too! Oh my god all of this food looks sooo yummy! I hope I‘ll get to go to NYC soon, so that I am able to try a few of these spots. Seems like you had an awesome little trip, Nori is just the cutest! Uniqlo has really great pieces! Thanks for all the cute pictures and food looks extremely yummy! Those sushi donuts look so cute. But definitely not as cute as Nori. OMG I love her smile! All of the food looks incredible! That’s one thing I love about NYC, the food. Last time I was there we hit up Brown’s Bagels near Madison Square Garden for breakfast, Vincent’s Little Italy for lunch and the Penzy Food Hall by Penn Station for dinner. Looks like such a sweet little getaway! Before I had my daughter, I always thought travel with be so tough with kids. But I discovered it makes the trip more special somehow, and I love seeing her enjoy new surroundings. She a bit older than your daughter (just turned 3), but she’s already obsessed with hotels, pools and room service. Glad you had fun! Enjoyed your post. What is the top you are wearing under the fleece jacket? All that food looks incredibly delicious! All the food looks so good. Nori is such a little cutie pie! What size do you wear in Uniqlo leggings? Thank you so much for all of these great restaurant recommendations! <3 🙂 I've been wanting to go to NYC again for the longest time (my last trip was 2 years ago)! And oh, thanks for the review of the Uniqlo Heattech series too! I've been wanting to get some! Ohhhh your little Angel looks so happy and so cute! Love ♥️it! I’ve been following you for several years now and I love your blog! Thanks for making this a place us petite ladies can get inspiration (and hopefully without alterations)! I appreciate that you always try to post things on sale too. I love to travel, and I’m in the market for some petite friendly noise canceling over the ear headphones. Not earbuds, headphones, but all I have tried on are always too big on my head. Since you love traveling too, I would love if you would do a review on some and let us know what work well! Thanks so much!! Looks like a great trip and can’t believe you handled Nori that whole time! The sushi bagel looks great!